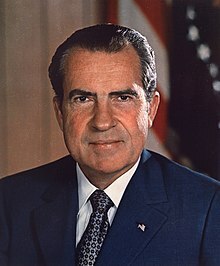 Richard Milhous Nixon was an American politician who served as the 37th President of the United States from 1969 until 1974, when he became the only U.S. president to resign from office. He had previously served as a U.S. Representative and Senator from California and as the 36th Vice President of the United States from 1953 to 1961 under the Presidency of Dwight D. Eisenhower. Richard Milhous Nixon (January 9, 1913 – April 22, 1994) was an American politician who served as the 37th President of the United States from 1969 until 1974, when he became the only U.S. president to resign from office. He had previously served as a U.S. Representative and Senator from California and as the 36th Vice President of the United States from 1953 to 1961 under the Presidency of Dwight D. Eisenhower. Nixon was born in Yorba Linda, California. After completing his undergraduate studies at Whittier College, he graduated from Duke University School of Law in 1937 and returned to California to practice law. He and his wife Pat moved to Washington in 1942 to work for the federal government. He subsequently served on active duty in the U.S. Navy Reserve during World War II. Nixon was elected to the House of Representatives in 1946 and to the Senate in 1950. His pursuit of the Hiss Case established his reputation as a leading anti-communist, and elevated him to national prominence. He was the running mate of Dwight D. Eisenhower, the Republican Party presidential nominee in the 1952 election. Nixon served for eight years as vice president. He waged an unsuccessful presidential campaign in 1960, narrowly losing to John F. Kennedy, and lost a race for Governor of California to Pat Brown in 1962. In 1968, he ran for the presidency again and was elected by defeating incumbent Vice President Hubert Humphrey. Nixon ended American involvement in the war in Vietnam in 1973 and brought the American POWs home, and ended the military draft. Nixon's visit to the People's Republic of China in 1972 opened diplomatic relations between the two nations, and he initiated détente and the Anti-Ballistic Missile Treaty with the Soviet Union the same year. His administration generally transferred power from Washington to the states. He imposed wage and price controls for a period of ninety days, enforced desegregation of Southern schools and established the Environmental Protection Agency. Nixon also presided over the Apollo 11 moon landing, which signaled the end of the moon race. He was reelected in one of the largest electoral landslides in U.S. history in 1972, when he defeated George McGovern. The year 1973 saw an Arab oil embargo, gasoline rationing, and a continuing series of revelations about the Watergate scandal. The scandal escalated, costing Nixon much of his political support, and on August 9, 1974, he resigned in the face of almost certain impeachment and removal from office. After his resignation, he was issued a pardon by his successor, Gerald Ford. In retirement, Nixon's work writing several books and undertaking of many foreign trips helped to rehabilitate his image. He suffered a debilitating stroke on April 18, 1994, and died four days later at the age of 81. When an energy crisis causes a fuel shortage, Nixon becomes the first president to fly commercial in this bonus clip from "The Secret History of Air Force One". Is is possible that Ronald Reagan might not have been president? Historian Timothy Naftali explores what might have happened if Nixon hadn't resigned.